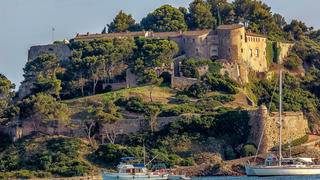 While mere mortals celebrity spot at Plage Pampelonne, the discreet elite drop anchor at these Côte d’Azur island gems. In truth, the French have been actively dissuading the hoi polloi from descending upon their lesser-known isles for centuries. Several were military forts, where retired captains could sip pastis in peace. Others were placed under national park protection, with the proviso that those wealthy enough could moor alongside at night. 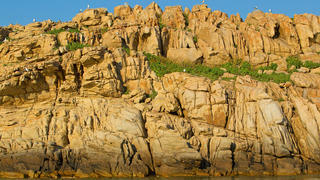 Only four of these island jewels can be reached by public ferry, and even then the service is patchy at best. The rest require a seaborne assault by yacht – or chopper. Cars are banned on all. But don’t think a boastful Champagne selfie will win you any friends. Carrying anything as unseemly as an iPhone on Cavallo Island will see you relegated to the Prosecco league. 1. Cavallo Hideaway Rating: **** The Romans chose Cavallo as a penal colony. It’s remote, has minimal harbour facilities and is nigh impossible to find on a map: the perfect conditions for today’s A-list habitués. The secret spilled out in the 1970s when Catherine Deneuve and Petula Clark would beach up by speedboat. Roberto Cavalli is part owner of the tiny marina that opened on the private island’s southern tip a decade or so ago. He and his beloved dog Lupo regularly stroll the silken sands, greeting guests such as Paris Hilton and Alicia Keys. Island transport is by mountain bike, Mustique-style “mule” (otherwise known as a golf buggy) or on one of the horses kept by discreet island hotel Les Pêcheurs. The hotel can also provide passing yachts with anything from a sushi platter to a full-blown beach party catered by a private chef. Intrigued? Sailors can take a leisurely cruise across from Corsica. Alternatively, Les Pêcheurs can organise a €500 four-person chopper from Arzachena airstrip near Porto Cervo. 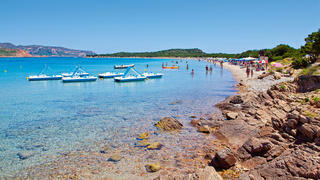 While mere mortals celebrity spot at Plage Pampelonne, the discreet elite drop anchor at these Côte d’Azur island gems. In truth, the French have been actively dissuading the hoi polloi from descending upon their lesser-known isles for centuries. Several were military forts, where retired captains could sip pastis in peace. Others were placed under national park protection, with the proviso that those wealthy enough could moor alongside at night. Only four of these island jewels can be reached by public ferry, and even then the service is patchy at best. The rest require a seaborne assault by yacht – or chopper. Cars are banned on all. But don’t think a boastful Champagne selfie will win you any friends. Carrying anything as unseemly as an iPhone on Cavallo Island will see you relegated to the Prosecco league. The Romans chose Cavallo as a penal colony. It’s remote, has minimal harbour facilities and is nigh impossible to find on a map: the perfect conditions for today’s A-list habitués. The secret spilled out in the 1970s when Catherine Deneuve and Petula Clark would beach up by speedboat. Roberto Cavalli is part owner of the tiny marina that opened on the private island’s southern tip a decade or so ago. He and his beloved dog Lupo regularly stroll the silken sands, greeting guests such as Paris Hilton and Alicia Keys. Island transport is by mountain bike, Mustique-style “mule” (otherwise known as a golf buggy) or on one of the horses kept by discreet island hotel Les Pêcheurs. The hotel can also provide passing yachts with anything from a sushi platter to a full-blown beach party catered by a private chef. Intrigued? Sailors can take a leisurely cruise across from Corsica. Alternatively, Les Pêcheurs can organise a €500 four-person chopper from Arzachena airstrip near Porto Cervo. Hideaway Rating: **** Drop the private island of Degaby into conversation to send fellow yachters scrambling for their maps. Louis XIV turned this sea-ringed speck into an island fortress in 1703. Its modern history began in the 1960s, when businessman Monsieur Boursier tried to create an island nightclub linked by a 200 metre funicular to the mainland. After decades of abandonment, hip Marseille hotel C2 has created France’s most under-the-counter beach club. Day guests can pull up by kayak or RIB for Mimosas or French 75s. Drop the private island of Degaby into conversation to send fellow yachters scrambling for their maps. Louis XIV turned this sea-ringed speck into an island fortress in 1703. Its modern history began in the 1960s, when businessman Monsieur Boursier tried to create an island nightclub linked by a 200 metre funicular to the mainland. After decades of abandonment, hip Marseille hotel C2 has created France’s most under-the-counter beach club. Day guests can pull up by kayak or RIB for Mimosas or French 75s. Hideaway Rating: ***** The smallest of our secret islands, Île d’Or was named for its tiny castle that glows gold in the setting sun. In 1897, architect Léon Sergent purchased it from the French government for the princely sum of 280 Francs. That’s about €36. Or less than the price of a sunlounger at Club 55, an hour’s sail down the coast. Alas, Sergent gambled the island away during a round of high-stakes cards with Doctor Auguste Lutaud. The doctor had delusions of grandeur (and who wouldn’t, with their very own island surrounded by coastal drop-offs and stocks of giant grouper and striped bass). He declared himself king of the island, built a mock Saracen castle and hosted wild parties under the pseudonym Auguste 1st. The true story inspired the tale of Tintin and the Black Island. Today, landing by boat on Île d’Or is forbidden, but kayaking the 500 metres from the mainland’s Estérel county park is warmly encouraged. The smallest of our secret islands, Île d’Or was named for its tiny castle that glows gold in the setting sun. In 1897, architect Léon Sergent purchased it from the French government for the princely sum of 280 Francs. That’s about €36. Or less than the price of a sunlounger at Club 55, an hour’s sail down the coast. Alas, Sergent gambled the island away during a round of high-stakes cards with Doctor Auguste Lutaud. The doctor had delusions of grandeur (and who wouldn’t, with their very own island surrounded by coastal drop-offs and stocks of giant grouper and striped bass). He declared himself king of the island, built a mock Saracen castle and hosted wild parties under the pseudonym Auguste 1st. The true story inspired the tale of Tintin and the Black Island. Today, landing by boat on Île d’Or is forbidden, but kayaking the 500 metres from the mainland’s Estérel county park is warmly encouraged. Hideaway Rating: *** “Green Island” is the scene of the South of France’s best group swim: a yearly mass paddle, in May, from the nearby fishing village of La Ciotat. The scene on arrival is otherworldly. 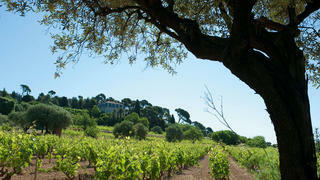 Lying midway between Bandol and Cassis, expect an uninhabited lost world of eucalyptus and holm oak. The windswept cove of Calanque Seynerolles feels more pristine Corsica than poseur Côte d’Azur. Owners of yachts with lots of anchor chain can party by night alongside their own private island. “Green Island” is the scene of the South of France’s best group swim: a yearly mass paddle, in May, from the nearby fishing village of La Ciotat. The scene on arrival is otherworldly. Lying midway between Bandol and Cassis, expect an uninhabited lost world of eucalyptus and holm oak. The windswept cove of Calanque Seynerolles feels more pristine Corsica than poseur Côte d’Azur. Owners of yachts with lots of anchor chain can party by night alongside their own private island. Hideaway Rating: *** Forget the car. Not even bikes are allowed on Port-Cros. Here almost 22 miles of hiking trails lead through woods to translucent seas. As France’s first marine national park, the waters host 180 fish species including eagle rays. From Plage du Palud a five-buoy snorkel trail leads out to the teeny tiny island of Rascas Rock. Of Port-Cros’s handful of shabbily chic restaurants, Le Manoir does a fine line in monkfish medallions and tuna with shaved cumbawa. Forget the car. Not even bikes are allowed on Port-Cros. Here almost 22 miles of hiking trails lead through woods to translucent seas. 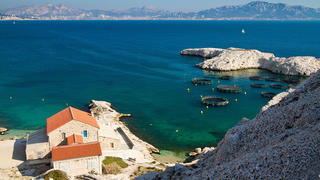 As France’s first marine national park, the waters host 180 fish species including eagle rays. From Plage du Palud a five-buoy snorkel trail leads out to the teeny tiny island of Rascas Rock. Of Port-Cros’s handful of shabbily chic restaurants, Le Manoir does a fine line in monkfish medallions and tuna with shaved cumbawa. Hideaway Rating: ** Since Roman times, sailors have been quarantined on Ratonneau. Lucky devils. This sun-seared granite speck has a Croatian quality: tiny beaches, jump-right-in rocks and more than 300 species of flora, including sea lilies that scent the spring breeze. The ruin of Hôpital Caroline now forms the backdrop for the yearly MIMI festival in early July, a 10-day blowout of musical avant-garde. The Romans also built a simple causeway across to Pomègues, Ratonneau’s beautiful little brother. A secluded 700-berth marina now sits between the two islands. Best of all, the entire Frioul archipelago (which includes these islands as well as the Alcatraz-style Château d’If resides within the Calanque National Park, so those teeming shoals of brown grouper and John Dory are protected forever more. Since Roman times, sailors have been quarantined on Ratonneau. Lucky devils. This sun-seared granite speck has a Croatian quality: tiny beaches, jump-right-in rocks and more than 300 species of flora, including sea lilies that scent the spring breeze. The ruin of Hôpital Caroline now forms the backdrop for the yearly MIMI festival in early July, a 10-day blowout of musical avant-garde. The Romans also built a simple causeway across to Pomègues, Ratonneau’s beautiful little brother. A secluded 700-berth marina now sits between the two islands. Best of all, the entire Frioul archipelago (which includes these islands as well as the Alcatraz-style Château d’If resides within the Calanque National Park, so those teeming shoals of brown grouper and John Dory are protected forever more. Hideaway Rating: ** You may not be the most illustrious yachtsman to have moored in Bendor’s tiny north-facing marina. In 1950, pastis kingpin Paul Ricard purchased the island and hived off a harbour to service his mates, Salvador Dali and Marcel Pagnol included. Ricard dispensed with the grazing sheep and added a tennis court and an art gallery, plus a 3.7 mile long causeway that can be covered by mountain bike or electric scooter. A dozen hip restaurants serve rosé from the region’s Bandol vineyards, while more casual eateries include an Airstream food truck that bangs out roast duck burgers with a shallot and red wine sauce. Back at the marina a monolith bears Paul Ricard’s personal motto: nul bien sans peine (“no pain, no gain”). An apt saying if you’ve overdone his firm’s Pastis 51 the night before. 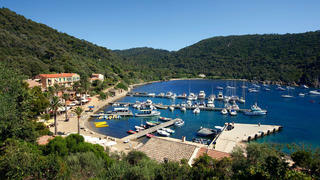 You may not be the most illustrious yachtsman to have moored in Bendor’s tiny north-facing marina. In 1950, pastis kingpin Paul Ricard purchased the island and hived off a harbour to service his mates, Salvador Dali and Marcel Pagnol included. Ricard dispensed with the grazing sheep and added a tennis court and an art gallery, plus a 3.7 mile long causeway that can be covered by mountain bike or electric scooter. A dozen hip restaurants serve rosé from the region’s Bandol vineyards, while more casual eateries include an Airstream food truck that bangs out roast duck burgers with a shallot and red wine sauce. Back at the marina a monolith bears Paul Ricard’s personal motto: nul bien sans peine (“no pain, no gain”). An apt saying if you’ve overdone his firm’s Pastis 51 the night before. 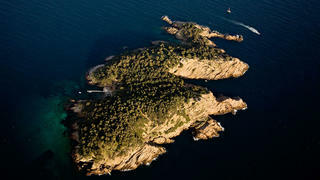 Hideaway Rating: *** You know that island opposite the Hotel du Cap-Eden-Roc that you glide over when flying to Nice? It has a fabulously secluded backstory. Hermit monk St Honorat arrived in AD410, his sole wish to meditate in peace under the Aleppo pines. Within 20 years dozens of disciples rocked up to share St Honorat’s unparalleled sea view – swim south and the next stop is Tunisia. The monks now share a symbiotic relationship with Hollywood’s elite, who sail across for stuffed octopus and burrata at alfresco restaurant La Tonnelle. The monks provide the Viognier from their eight-hectare vineyard, while the stars pay handsomely for the privilege of not being papped. (Handily, the brothers are prevented from talking to the press by a vow of silence.) After the last shuttle boat to Cannes departs at 6pm, sailors who moor between Saint-Honorat and fellow island gem Ste-Marguerite will find nirvana strictly for themselves. You know that island opposite the Hotel du Cap-Eden-Roc that you glide over when flying to Nice? It has a fabulously secluded backstory. Hermit monk St Honorat arrived in AD410, his sole wish to meditate in peace under the Aleppo pines. Within 20 years dozens of disciples rocked up to share St Honorat’s unparalleled sea view – swim south and the next stop is Tunisia. The monks now share a symbiotic relationship with Hollywood’s elite, who sail across for stuffed octopus and burrata at alfresco restaurant La Tonnelle. The monks provide the Viognier from their eight-hectare vineyard, while the stars pay handsomely for the privilege of not being papped. (Handily, the brothers are prevented from talking to the press by a vow of silence.) After the last shuttle boat to Cannes departs at 6pm, sailors who moor between Saint-Honorat and fellow island gem Ste-Marguerite will find nirvana strictly for themselves. Hideaway Rating: ***** If you let slip that you have been hanging out in the summer retreat of presidents de Gaulle, Chirac and Sarkozy, acquaintances might question the bibulousness of your lunch. But in 2014 François Hollande welcomed curious visitors to France’s presidential retreat – a breathtaking island mansion – for the first time in a gesture of “openness”. After all, Fort Brégançon offers little presidential privacy against the long-lens cameras so abhorred by the current incumbent. And it costs an annual €200,000 in upkeep. But mooring too close would still invite the ire of France’s Republican Guard. Instead, visitors may disembark from a tender at nearby Plage Brégançon, before touring the fort’s inner sanctum. Just don’t expect Versailles-style marble and gilded mirrors. The fort encapsulates the barefoot bling of a Cap d’Antibes retreat: Provençal tile floors, an alfresco dining table and a private beach. If you let slip that you have been hanging out in the summer retreat of presidents de Gaulle, Chirac and Sarkozy, acquaintances might question the bibulousness of your lunch. But in 2014 François Hollande welcomed curious visitors to France’s presidential retreat – a breathtaking island mansion – for the first time in a gesture of “openness”. After all, Fort Brégançon offers little presidential privacy against the long-lens cameras so abhorred by the current incumbent. And it costs an annual €200,000 in upkeep. But mooring too close would still invite the ire of France’s Republican Guard. 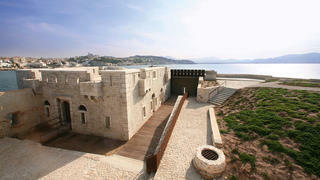 Instead, visitors may disembark from a tender at nearby Plage Brégançon, before touring the fort’s inner sanctum. Just don’t expect Versailles-style marble and gilded mirrors. The fort encapsulates the barefoot bling of a Cap d’Antibes retreat: Provençal tile floors, an alfresco dining table and a private beach. Hideaway Rating: **** Anyone who says the Med is dead has never visited this six-island archipelago comprising a 36-hectare marine reserve, which has remained uninhabited by humans since records began. Have your steward pour a tumbler of Hendrick’s as you spot peregrine falcons, puffins and storm petrels from deck. With a mask and snorkel, nature is even more vivid: think bottlenose dolphins, rock lobsters and tiny cardinal fish. Anyone who says the Med is dead has never visited this six-island archipelago comprising a 36-hectare marine reserve, which has remained uninhabited by humans since records began. Have your steward pour a tumbler of Hendrick’s as you spot peregrine falcons, puffins and storm petrels from deck. With a mask and snorkel, nature is even more vivid: think bottlenose dolphins, rock lobsters and tiny cardinal fish.